Etymology: 'Dwelling by a river'. Distribution: Only found on Mount Elliot, Bowling Green Bay NP (30 km SE of Townsville, north-eastern Queensland). 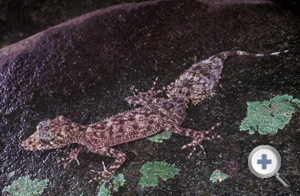 Habitat: Found amongst boulders in moist forest extending from the upper slopes of Mt Elliot.